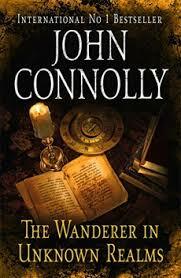 Recently, John Connolly published a new novella called The Wanderer in Unknown Realms. Like his more recent novels, this short work explores the supernatural world as it seeps into our everyday surroundings. Over the course of the next seventeen chapters, Soter encounters eccentrics galore, from the odd father and daughter book procurers to Maggs the Maggot, a man whose reputation is enough to keep anyone away. And, as if that were not enough, there are also the otherworldly insect creatures and the strange presence within Maulding’s residence; both of which seem to exist solely to keep Soter questioning his own sanity. Soter is able to discover that Maulding was in search of a very rare book, the Atlas of Unknown Realms, when he went missing. Rumored to hold the key to the multiverse – a series of alternate realities – this book is priceless. But because it is a book of the Occult, it also comes with a price beyond money. Working with an extended metaphor here, Connolly seems to be making the case for how books can change the world. While the change in the novella is definitely supernatural, it is easy enough to grasp the idea that the reading of books does indeed change who we are and the world around us. It is no accident that this novella reads as an homage of Victorian gothic tales and Connolly certainly seems to be channeling his inner Dickens with the setting, occupations and the use of unique character names. Not for the faint-hearted, there a several passages in this story that will creep out even the most jaded horror fiction fan. And be forewarned that this short work does not come with any easy resolutions. I can easily see Connolly writing a series of vignettes set in this fantastical historical setting which would continue the tale of Soter and the other characters he meets. 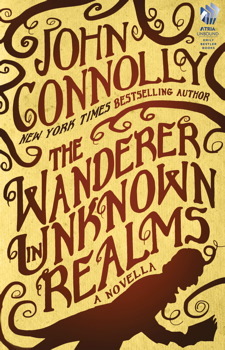 While John Connolly’s fans await the next novel in the Charlie Parker series, The Wanderer in Unknown Realms is a nice diversion to while away a few summer hours. The book includes a collection of lovely illustrations by Emily Hall which add to the old-world feel of the work. Available in both e-book form and a limited edition hardcover, this novella would be a welcome addition to any library. You can’t beat that price. It’s a short novella, but the illustrations look great on the Kindle. I do hope he writes a few more in this universe. Maybe even a sort of prequel to tell how Maulding disappeared. I think I’ll be picking this one up. You’ve peaked my interest quite a bit! I’d be interested to know what you think of it Ingrid. Thanks Mar. Glad you are enjoying the novella. And yes, I too, can’t wait until the next Parker. But we have another novella and John’s sci-fi collaboration to look forward to until then.